For puppies and pregnant or nursing dogs, Science Diet Puppy Small Bite combines top-quality ingredients in a bite-size kibble that's easy for small breeds to chew. With essential nutrients for the special needs of your pet, this food helps promote a healthy skin and coat, while protecting against the risk of disease. 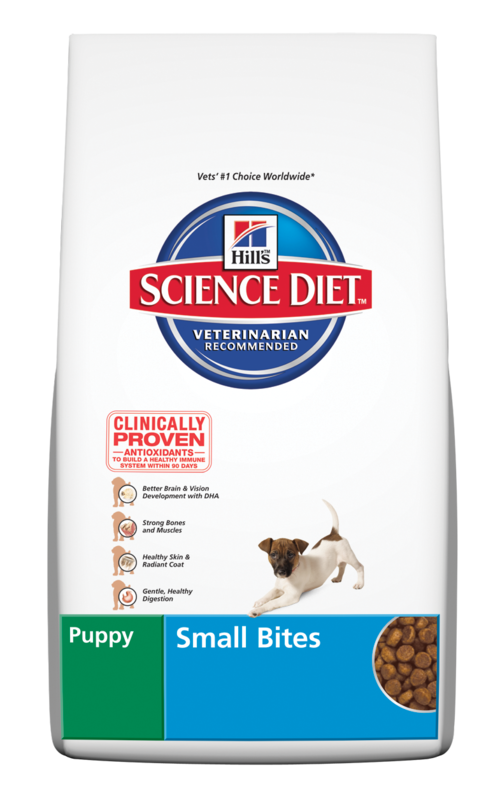 An ideal combination of tasty ingredients helps your puppy's body grow strong and healthy. It is enhanced with natural DHA, an Omega-3 fatty acid vital in the development of the brain and nervous system in puppies. For small dogs and dogs who prefer a smaller kibble. Also great for pregnant and nursing dogs. Whole Grain Corn, Chicken By-Product Meal, Corn Gluten Meal, Animal Fat (preserved with mixed tocopherols and citric acid), Dried Beet Pulp, Chicken Liver Flavor, Brewers Rice, Dicalcium Phosphate, Lactic Acid, Fish Oil, Flaxseed, Soybean Oil, Iodized Salt, Potassium Chloride, L-lysine, Choline Chloride, Vitamin E Supplement, vitamins (L-ascorbyl-2-polyphosphate (source of vitamin C), Vitamin E Supplement, Niacin, Thiamine Mononitrate, Vitamin A Supplement, Calcium Pantothenate, Biotin, Vitamin B12 Supplement, Pyridoxine Hydrochloride, Riboflavin, Folic Acid, Vitamin D3 Supplement), Magnesium Oxide, minerals (Ferrous Sulfate, Zinc Oxide, Copper Sulfate, Manganous Oxide, Calcium Iodate, Sodium Selenite), preserved with Mixed Tocopherols and Citric Acid, Phosphoric Acid, Beta-Carotene, Rosemary Extract.